UNITED NATIONS, Oct 3 2017 (IPS) - When US Ambassador Nikki Haley called for a virtual arms embargo against the repressive and much-maligned military regime in Myanmar, she took a passing shot at two of her fellow veto-wielding, permanent members of the Security Council – namely China and Russia – who are primary arms suppliers to the increasingly politically-isolated nation. “And any country that is currently providing weapons to the Burmese military should suspend these activities until sufficient accountability measures are in place,” she demanded, during last week’s debate in the UN Security Council. The US, which has consistently refused to recognize the country’s name-change (from Burma to Myanmar), said “the world has endured images from Burma we should never have to see”—even as that government stands accused of “ethnic cleansing” of Rohingya Muslims. Myanmar’s military clout and its political arrogance depend largely on the staggering array of Russian and Chinese weapons at its command. And any resolution imposing economic or military sanctions on Myanmar is likely to be vetoed either by China or Russia – or both. According to the Stockholm International Peace Research Institute (SIPRI), between 2010 and 2016, China reached agreements to transfer a variety of weapons to Myanmar, including anti-ship missiles, surface-to-air missile systems, frigates, and tanks. During the same time period, Russia reached agreements to sell fighter aircraft, combat helicopters, light helicopters, and surface-to-air missiles. Meanwhile, Israel’s longest running newspaper, Haaretz, has accused Israel of “arming war criminals”. 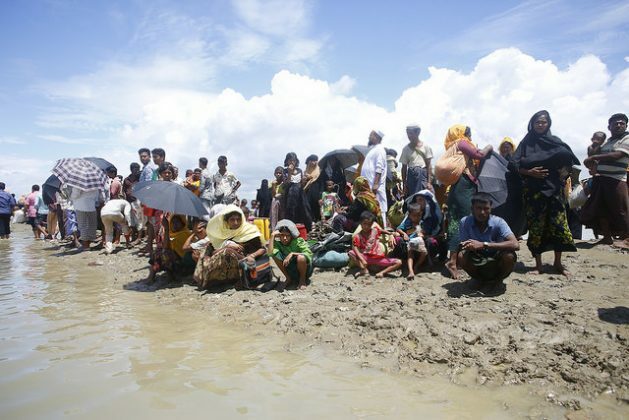 In an editorial early September, the newspaper said the violence directed at Myanmar’s Rohingya minority by the country’s regime has intensified, including burning of their villages—“information that has been confirmed by satellite images”. “But none of this has led to a change in the policy of the Israeli Defense Ministry, which is refusing to halt weapons sales to the regime in Myanmar”. In a September 18 editorial titled “Squeeze Myanmar’s Military”, the New York Times condemned “Myanmar military’s vicious crackdown against the Muslim Rohingya minority in Rakhine State”. Given Myanmar’s progress towards democracy, former US President Barack Obama lifted longstanding US sanctions against Myanmar last year despite warning by human rights groups that easing the pressure was premature. Additionally, a global coalition of some 88 civil society organizations (CSOs) is calling on the Security Council to seriously consider an arms embargo against the military– and targeted sanctions against individuals responsible for crimes and serious abuses. “All concerned UN member states should also consider bilateral, multilateral, and regional actions they can take to place added pressure on the Myanmar government,” the coalition said. “In particular, we call on all states to immediately suspend military assistance and cooperation with Myanmar,” said the coalition in a statement released September 28. The coalition includes Amnesty International, Human Rights Watch, Refugee International, Burma Campaign UK, the National Council of Churches and Minority Rights Group International. Myanmar’s huge arsenal includes MiG-29 fighter planes, Antonov An-148 transport planes, Mi-35 attack helicopters and T-55 and T-72 battle tanks (all from Russia) and Chengdu F-7/FT-7 Airguard and Nanchang A-5M fighters and ground attack aircraft, Aung Zeya Class and Jianghu II class frigates, Offshore Patrol Ships, HQ-2 surface-to-air missiles, 122mm and 130mm artillery, battlefield rocket launchers and other munitions (all from China). The military regime appears battle-ready for any possible confrontation with neighbouring Bangladesh, which has demanded that Myanmar take back the nearly 700,000 Rohingya Muslim refugees driven out of the country — and seeking shelter in Bangladesh. Daniel Darling, Senior Military Markets Analyst, Europe & Asia/Pacific Rim at Forecast International Inc, a US-based company providing defence market intelligence, forecasting, and research, told IPS that besides China and Russia, other key arms suppliers include North Korea and Pakistan. Of particular note, he pointed out, is that Myanmar has reportedly ordered 16 Chinese-Pakistani JF-17 Thunder multirole fighters, of which initial deliveries are expected to begin later this year. Asked about U.S. relations with Myanmar, Darling said the US has not provided Myanmar with any weaponry or reinstituted access to the International Military Education and Training (IMET) program for the nation despite a longstanding US embargo being lifted by the Obama administration. He said the Tatmadaw military budget for 2016 was estimated at about $2.33 billion, whilst the 2017 earmark is placed at $2.14 billion. The defense budget for Myanmar is, in general, quite inscrutable and all figures involve topline budgetary governmental requests which likely do not include supplemental areas of funding for which the military has exclusive access, he added. With an automatic allocation of one-third of the seats in the lower house granted to the military, all budgeting naturally must pass through Tatmadaw review and thus receive its support. Of particular note, the Tatmadaw has, through the Special Funds Law, the power to grant itself additional – even unlimited – funds without announcing its actions to Parliament beforehand or seeking the legislature’s approval, Darling said. Whether this continues to hold up, or be amended in some form, over the course of the National League for Democracy’s governance remains to be seen, but for now it appears Aung San Suu Kyi, the de facto ruler, is unwilling to deviate from the delicate dance she and her party must perform in order to prevent Tatmadaw from sweeping aside her government and re-imposing purely martial control, he said. Dr. Natalie J. Goldring, a Senior Fellow with the Security Studies Program in the Edmund A. Walsh School of Foreign Service at Georgetown University, told IPS that Ambassador Haley, in her statement, cited the Myanmar military’s human rights abuses against the Rohingya. “News accounts make it clear that Ambassador Haley’s concerns are well founded,” she added. On the surface, it’s surprising that the Trump administration is calling for an embargo on weapons to Myanmar. Restraint in weapons transfers hasn’t exactly been a feature of the administration’s actions thus far, said Dr Goldring, who also represents the Acronym Institute at the United Nations on conventional weapons and arms trade issues. In fact, the Administration is reportedly engaged in a review of US arms transfer policy designed to increase promotion of US arms transfers. It’s apparently much easier for the US government to argue for an arms embargo to a country that’s not one of its customers, Dr Goldring said. She said the same arguments in favor of an arms embargo on Myanmar also apply to arms transfers to other countries. For example, Human Rights Watch and others have documented systematic Saudi violations of international human rights and humanitarian law in Yemen. This coming from the representative of the “largest military arms exporter”. Look up the listing, Wikipedia has it.